The former Paradise Club has an all-new name and completed renovated venue for summer 2017 — it’s now the TRU Paradise beach club and restaurant and it hosts special party events with big-name DJs from time to time. Feature acts for Tuesday July 25, for example, were Ummet Ozcan and 2 Faced Funks. 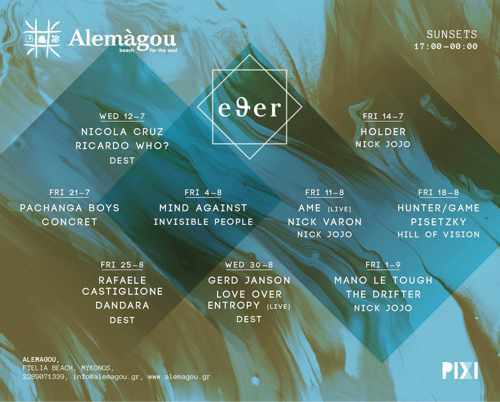 Alemagou will be hosting nine EΘER events this summer, a series of new concept parties being held between July 12 and September 1. 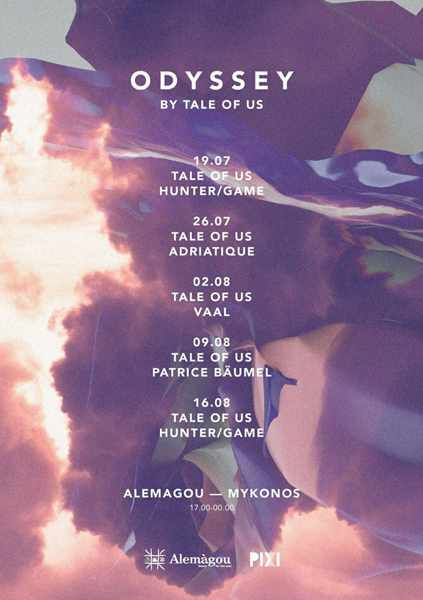 Alemagou also is hosting Odyssey, a “5-week sunset-session residency curated by Tale Of Us.” These parties begin Wednesday July 19 and continue each Wednesday evening (from 5 p.m. til midnight) until August 16. 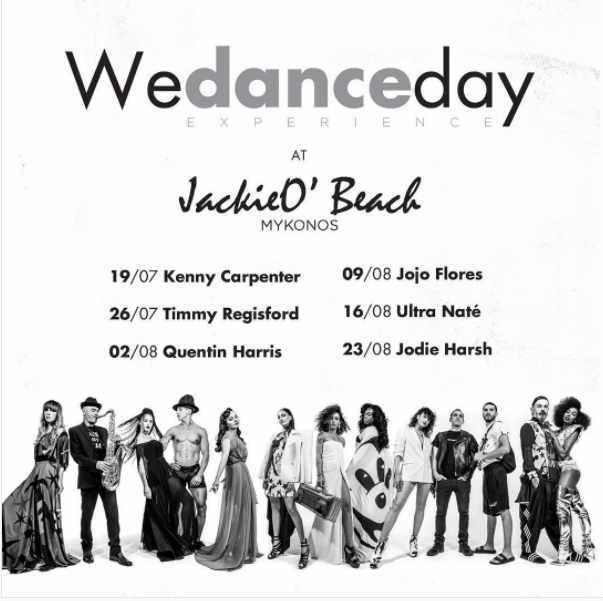 JackieO’ Beach club introduces Wedanceday Experience for summer 2017. The “fashion-themed” parties feature a team of 12 resident artists and DJs whose mission is to unite with the crowd on the dance floor and, through their unique artistic expression, elevate all participants “to a state of pure happiness and pure party feeling.” The parties will be held each Wednesday from July 19 through to August 23. For tickets and VIP table reservations, contact the bars and clubs directly. I’m planning on being there from April 13th through the 24th (28 year old male, like to party), and I know it’s pretty early on in the season but it’s also during the Orthodox Easter time frame…any suggestions? Should I schedule later on in the season or will there be enough parties to entertain me for a few days? Thanks for the response Maounas, I will definitely check those out! Some of the bars at Paradise beach will be open, including Guapaloca, but Paradise Club won’t be open until the end of May at the earliest. At that time of summer there will be dozens of great places to party … you should just keep checking the blog post for event announcements to see what appeals to you. If there is somewhere you definitely want to go, check booking availability directly from the club or bar you’re interested in. Otherwise, you would have to line up to get in … but reservations are not essential in most cases. I am planning to be in Mykonos on 10th and 11th May 2017 (during full moon). What All places are recommended for a good party? Any chances of any grand opening party in Cavo Paradiso or Paradise Club or anywhere else. Events taking place on those days have not been announced yet. No word yet either on when Cavo and Paradise club are holding their opening parties. When will the line-ups for 2017 be released? It’s not far away but we need to plan the holiday around Cavo / Super Paradise DJs. Any info would be great!! Your question was answered in the very first paragraph of the Mykonos Party Scene 2017 article. Im there in mykonos in between 22 to 28th of march 2017.will there be good parties that time? If I had heard of anything happening then, it would be posted in the article. Nothing has been announced. Am there in mykonos between 27th April to 1st may…how can we put to request to paradise club etc etc to please start their opening parties. Really want see one. Where would I find good parties during this time of the year???? We are a group of 8people coming. Paradise Club won’t be open then. Neither will Cavo Paradiso. The big clubs don’t open until May. Hi, Thanks for all the info. My husband and I will be traveling with two 21 year old college students in June. Trying to find a place close enough to the nightlife for the college kids , yet not to crazy for us. We are knocking on the door of 50, but we still are a very active family. We often join the nightlife, but also like nice dinners and outdoor activities. Would like the kids to be able to walk to and from night clubs, ect.. Could you recommend a good hotel or villa, apt ect…, that has sea views but still close enough to the fun? Thanks for any help. You’ll want to be in or very close to Mykonos Town so you and the kids will be easy walking distance to all the nightlife, restaurants, shops, etc. Check hotel listings on sites like booking.com and TripAdvisor to see what’s available at the prices you’re willing to pay for your specific travel dates. Hi. We are in Mykonos from 23rd April to 26th april. Which are the most happening night clubs and lounges that would be open during this time. Your suggestions will definitely help us decide accordingly. Check through my blog post to see party announcements for that period of time. The post lists opening dates for places that are starting up in April. You’ll have to check out the various places to see which are the “most happening” because I can’t tell you where everybody is going to be gathering on those nights. Hey I will be in Mykonos April 8-10th. Any Boat events? None that I am aware of. It’s too early in the season — not enough tourists on the island. But ask around in some of the travel agencies / ferry ticket offices when you get to Mykonos and you’ll find out if anything is available. Hi, I’m planning on being there from June 9-13. How will the scene be on those dates? I’m hoping it won’t be too dead. It definitely won’t be dead, but don’t expect wall-to-wall people — the big crowds arrive during July and August. You will still have a great time! Hi! I will also be there for that weekend. Have you been? Is it difficult to navigate where the parties are as a solo traveler? Shannen, it’s easy to get around Mykonos Town to go from one bar/club to another …. it’s really not that big a place. Most bars are located on or close to the harbourfront and Little Venice seafront areas, at or near Lakka Square, as well as on or very close to the main shopping streets (which you won’t have any trouble finding because they’re lined with shops). August is peak travel season and on Mykonos that means peak service by the local bus system. Yes, you can get to the main beaches by bus and it’s the cheapest and best way to travel to beaches. Since there is going to be 5 or 6 of you, taking taxis is not practical since you would need to call for two taxis. ATVs are a bad idea, especially if you plan to drink at the parties. Buses will run practically all night long to Paradise beach in August, so it will be easy for you to get to any of the overnight parties at Cavo Paradiso or Paradise Club. And there is a shuttle bus service available for Super Paradise beach. Poseidon Hotel is a very short walk from Fabrika Square where you catch the bus to Paradise and several other major beaches including Paraga (in case you want to go to Scorpios) and Psaou (in case you want to party at Nammos). Your hotel staff will be able to tell you where to catch buses for specific beaches. I highly doubt the hotel will offer a shuttle service for beach parties. I have never heard of a hotel offering this. How are things there between May 13-22? I know it’s earlier in the season but wondering if the normal spots there will still be really fun at that point of the summer. Thanks much. Mid May is still early season so the summer crowds haven’t yet built up. But plenty of party places will be open and you’ll have a great time. It’s also likely that Cavo Paradiso will be opening during that timeframe so you might be able to go to a couple of events there including the opening night party. They still haven’t announced their opening weekend, but it’s usually the third weekend in May. Hi, myself and a few friends are coming in April 28-May 2nd. We know its early for the party scene but its the only time we could book due to work. Any suggestions on nightlife during that time? We did some research and it looks like a few places like Tropicana (opening night 27th) & Guapaloca Bar will be open. Well if you had researched my blog post you would have seen that a lot more bars and clubs will be open besides the two you mentioned. Hi me and my mates are coming to Mykonos end of June and staying at ACvillage christoulis not far from airport. Now I have seen locations of the bars etc in the town I am a bit worried we are to far out? How long would it take to get to the town from there and what’s the costs of taxi and busses? Definitely not a convenient location since it’s on the opposite side of the airport from town, according to its map location. That means you would have nearly a 2 kilometer drive to get around the airport and to the heart of town where the nightlife is. Can’t tell you what a taxi would cost because I’ve never taken one from or two the location you’ll be staying in. I would guess €15 one way. Keep in mind taxis take only four people maximum. Take her wherever you go to party …. 50s isn’t too old for partying on Mykonos. Any events on from 20th-27th July 2017? Lots of events at that time! But they haven’t been announced yet. I list events when information about them is released, and it’s way too early for clubs to be releasing their July schedules. Hi we are 4 guys, and we will stay in mykons from 28th april till 1st of May, any suggestion for good parties? Thabks! Any idea as to what date Nammos will be hosting Remos in July this year? And who the support act will be? If I knew when it was happening it would be on my blog. Nothing has been announced. we are going to be in Mykonos with our 20 year old “kids’ september 8-17th and want to find out if the beach parties and nightlife are still open and going strong. If so is it everyday like sunday mon tues) or only the end of the week. I understand this is not peak party time but want to make sure it is still good. thanks! Yes, the beach parties and nightlife still continue at the time you’re planning to visit. Also coming September 9th to 15th.. will I be able to find a list of september bars/events/closing party dates? That is months away — events have not been announced for September. Are there specific days and nights of the week that are bigger for partying? For example is Friday and Saturday big nights? Which is the best time to arrive in the week for optimal partying. take place on weekends. Crowds will be bigger the weekend of May 26 to 29 this year because that’s the weekend thousands of Greek university students will go to Mykonos to party. And there will be more people the following weekend (June 2 to 6) because it’s the Holy Spirit long holiday in Greece. Expect huge crowds if there’s a big-name Greek entertainer doing a show at a club (for example, Antonis Remos’s annual gig at Nammos). And some nights are busier for specific clubs. At Scorpios, for instance, the busiest days/nights last year were Tuesdays, Thursdays and Sundays. Hi, hoping to come to Mykonos myself, husband, son and his mate will the two 17 year olds be alright that time of year??? They obvs want some party scene!!! When are you going? You didn’t say what time of season you’re travelling. I am heading to mykonos from 5/26-5/30 with my fiancé and another couple. We are in our mid-late 20s and are looking for some options for nightlife. I know there will be lots of university students there so does that mean we won’t get in to places like Skandanavian bar etc? Or are there bars where slightly older people go to avoid the university students. Thanks! 2) is Mykonos has the most activity as an island for parties and nightlife ? 1) Mykonos is absolutely NOT “more of a gay island.” It’s a gay-friendly island with several gay bars and clubs, but the VAST majority of the many party places on Mykonos are “straight” and the vast majority of people who go to Mykonos are “straight.” If you look through the events I posted you will see there are only a few for gay clubs. 2) Mykonos is known as the Greek island with the best nightlife. A cheaper to visit island with good nightlife is Ios. Key club events are listed on the website article to which you posted these questions. As also indicated in the article, you’ll find day parties at Paradise beach and at Super Paradise, starting at 4. You can wait til you get to the clubs to buy tickets. The bigger clubs, like Cavo Paradiso, do have VIP tables. Which day will be better in Nammos… saturday 10th? or thursday 8th?? And about Cavo Paradiso….what party will be the best, Fullmoon party in june 8th or axkid and Terry on saturday 10th? We are booked to be in Mykonos from July 18-20. We need your help and best recommendations on hotels, restaurants, and nightlife. Already planning on going to see Marshmello at Cavo on the 18th. Hi, I will be in Mykonos from August 19th to 23rd and wanted to know what are the best parties and nicght clubs around. Also, do I need to get tickets in advance? Thanks a lot for keeping the blog! Its been a lot of help! I will be in Mykonos from june 7th to 13th, which day of the week is the best for Nammos, Skorpios and Allemagou ? how is the nightlife in mid september in Mykonos? It’s still very active though many of the bigger clubs will have either closed or be starting to close by then. No shortage of places to party or people to party with, though. Hi, I’m looking to go to Mykonos September 20-27. Any suggestions ? Will there be a good experience of nightlife at that point in time ? Any suggestions/comments are appreciated. Thanks. You won’t experience the enormous crowds that Mykonos gets during July and August, and you also won’t get the top-name international DJs at that time of September. But there is still an active party scene and you will have a great time. Thank you! Your blog is very informative. 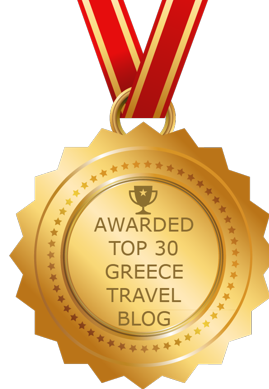 My husband and I are staying Mykonos from 26 Aug- 30 Aug and Santorini from 30 Aug- 02 September. Which clubs do you suggest for us to visit because I am really overwhelemed of the amount of clubs available for partying. 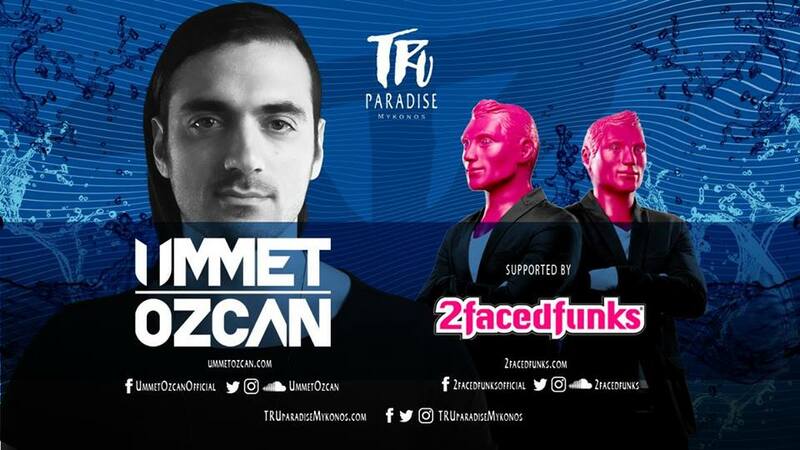 Had Paradise and Super Paradise clubs already released their DJ list? Thank you so uch in advnaec for your response. It’s your holiday — it’s for you to decide where to party! Just go with the flow and check out different places to see what you like best. As of mid June there has been no DJ lineup released by Paradise Club. And Super Paradise doesn’t release a schedule. There’s partying there every day, with special RnB parties every Friday and special Greek vibes parties every Sunday. how are the parties in mykonos from september 1-4th. do they slow down? is the partie’s still going on the first two weeks of september? The biggest clubs on the island will be closed then, but plenty of places will be open until early to mid October. Hi, We are visiting from 23 to 25 June, what would the best clubs to party in Mykonos? We prefer crowded places, thanks!! Hi, great post as always. Fourth year in a row now for me. Do you have more info about this Sant’Anna? I see they have Wednesday, Friday and Saturday brunch they claim. Would you suggest to go on a Wed for example and also stay at the beach club and try the restaurant? Between Tuesday and Thursday at Scorpios (week 24-30 July) what would you pick? Also, never tried Remezzo or either Ling Ling, what would be your recommendations? Since SantAnna is new and hasn’t opened yet, no-one can say if or when it’s best to go there — or what their brunch and other meals are like. For Scorpios either Tuesday or Thursday night would be good, unless there is a particular artist appearing either night that you would prefer to see. I’ve heard good things about Remezzo, and I’ve heard even better things about Ling Ling. If you want a view while you’re dining, Remezzo would be the place to go. For a chic courtyard resto-bar experience, Ling Ling is the place. Remezzo is a fine dining venue with Greek and Mediterranean, while Ling Ling has a Cantonese menu of small dishes based on local Greek ingredients. For clubs and bars it’s always a matter of preference plus what the crowd is like on any specific day or night. Any idea what is going on with Paradise Club? Isn’t it pretty strange they haven’t announced a DJ schedule yet and we are almost into July? No idea at all. I’ve been wondering myself why they haven’t announced any events. Hi! Great blog! I am looking to book Mykonos and Santorini for the first time for my 30th birthday September 21-October 4th.. I had read somewhere that the end of the summer parties at some of the clubs were the weekend of September 21, 22, and 23rd? I read that I should keep checking back and now I don’t see those dates at all that I originally saw and do not see any September dates posted!! :-/ Are these dates a good time to experience some of the end of the summer parties, restaurants, and the islands weather/amazing sunsets and views? is there any parties happening during first week of October? There will be, but nothing has been announced yet. Although the biggest clubs on the island will be closed, beach parties will continue at Paradise and Super Paradise, and lots of bars will be open in Mykonos Town. i wanted to ask will any of these beaches will be open during the first week of October? Those are beach clubs, not beaches — the beaches will of course be open in October. Nammos and Kalua will still be open. Scorpios usually closes in late September. Alemagou will probably be closed. i’m planning to visit first 10 days of October. did they announce the events happening in early October? also, what are the top beach clubs that will be open first week of October? If any events had been announced for October, I would have added them to my post about September and October parties. Keep checking that to see what’s happening in October. No announcements have been made yet. hello, we are coming with 10 guys for bachelor party AUG 2-8. We want to hit the right places on the right days. Please help us with some recommendations. Hi! We first timers to Mykonos on 27 July with our 2 18 year olds and staying in Ornos. Will it be easy for my kids to find/get to parties and are we too old to join in?!?! Your kids will have to travel into Mykonos Town or to other beach resort areas to find places to party. For beach parties they will be able to take the water taxis that leave from Ornos beach, but the last return boat is in early evening (around 6.30 p.m.) If they stay past then, they would have to take a bus from whichever beach to Mykonos Town, then a bus from there to Ornos. Most nightlife is in Mykonos Town, a short bus ride from Ornos. Last bus back to the beach will probably be around 2 a.m. By all means check out the nightlife yourselves, but for God’s sake don’t go party in the same clubs your kids are in — teenagers don’t want their parents hanging around while they’re trying to have a good time, especially on Mykonos! Blimey!! Bit harsh towards us 40 somethings!! But don’t worry wasn’t planning on embarrassing my kids and just looking forward to enjoying everything Mykonos has to offer! Thanks for your advice! Hello! My friend and I are coming to Mykonos July 20-23 to celebrate my 27th bday. We are staying in a hotel near Agia Anna Beach. What’s the best way to get to the paradise beach day parties and night clubs? Also is it better to purchase tickets in advance and if so, where can you do that? Which Agia Anna beach? There are 3 with that name on Mykonos. Oh didn’t realize that! Agia Anna Beach near Kalafatis. It looks like it’s a bit far from paradise beach on the map but this was our only option in our price range last minute. Appreciate any info you have, thank you!!! Your best option for getting to Paradise beach from there is to rent a vehicle or take taxis, which could be difficult to get and will add up. There is no direct bus service, so you would have to take the bus to Mykonos Town, and from there a different bus to Paradise beach. Although the buses to Paradise will run very late at night since it is peak season, the last bus service to the Kalafati area stops at midnight, so if you stay in Town or at Paradise beach for night parties,you would have to take a taxi back. Okay thank you. Do we need to buy tickets in advance? You don’t have to but if you want VIP tables you should. You will probably see promotional people at some of the beaches and in Mykonos Town and they can give you information about specific upcoming parties. Me and more two friend are going to Mykonos in Oct5th-8th. Read a lot that the main places will be closed. Any suggestion of nice clubs and bars that may be open during this period? We plan to go to Mykonos in September. Mostly for good music and stylish parties. Is it not too late yet? Are there still nice DJs and good parties? is it worth coming 29th september for a few days? will there be many events? It seems more places are staying open later this season so fingers crossed you will have a lot of bars to choose from while you are there. Although the biggest clubs will be closed, there are lots of smaller bars plus Skandinavian Bar that will still be going strong, and the beach parties will still continue at Paradise beach and likely Super Paradise, too. Stopping by on cruise ship early November, will you still be open? I am going to be in Mykonos late November, does anything happen in November? Or only during the summer? Some of the island’s bars remain open to serve local residents, and there are some parties and special events, including live Greek music entertainment. Vegera restaurant in Mykonos Town, for instance, has an “after luch party” with a DJ every Sunday. But the nightlife scene on Mykonos during winter is oriented toward people who live on the island, not tourists as is the case during the spring, summer and early autumn travel period. Hi we are planning to be in mykonos last of march. Will there be any restaurants or party places open on the beach. We are planning to stay in the city. Will there be any kind of summer feel in town. Thanks. There may be a couple of beach restaurants open the last week of March. Last year Tasos Taverna and Paraga Cafe, both at Paraga beach, opened during the last week of March, as did Elia retaurant at Elia beach. There won’t be any party places open at any of the beaches because it’s off season and there aren’t enough tourists visiting Mykonos to justify opening a beach club. There won’t be a summer feel in Mykonos Town because it won’t be summer — it is still early spring, which is off season — and the vast majority of shops, bars, restaurants, galleries and hotels will still be closed. March is a bad time to visit Mykonos if you want to enjoy the beach and especially if you’re looking for beach parties. Oh bummer..our tickets and hotels are all booked. I guess we will have to make the best of it. Any suggestions of whst we can do? At Cavo during July and August, there are top-name DJs playing every night of the week. At other beach clubs and bars in Mykonos Town, big-name DJs appear on weekends but also some nights during the week.